Slips, trips, and falls are the number one reason why so many people end up injured at the workplace. Injuries suffered from falling could range from minor to severe traumas and head injuries, broken bones, and lacerations. Being the most common causes of workplace injuries, slips and trips are something most business owners work on reducing. Whether you are an employee or an employer, here are some tips that will help you reduce the risk of falling at the workplace. The first thing you should do is start cleaning up the walking surfaces. If your work requires you to move around a lot, you have to be sure that nothing is in your way. That being said, you should start by cleaning all the clutter that is in the way or gathered anywhere close or near to working areas. Clutter is responsible for many people’s injuries as they tripped over it and ended up on their back. Clean it before it causes a lot of problems. If your working area is filled with computers, the chances are that there are many loose wirings in the room. And loose wirings mean only one thing – someone will trip and fall, eventually. That someone could be you or someone you love or care for. To reduce the risk of falling down, simply find a way to get rid of all those wires. Talk to your superiors (or your employer) and explain to them the risk of having loose wires in the office and the risk they present for the employees. Ask them to have someone re-install them around the edges of doors and walls, in order to minimize the chances of someone falling down. Either that or cover it with carpets that will let you and others walk over it without having to worry about tripping over them. 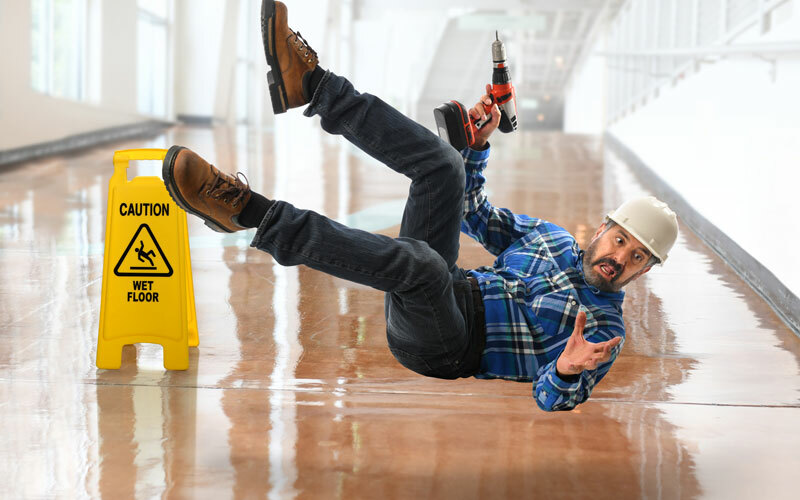 If you do end up falling down by getting tripped on a loose cable or wire, you should immediately call the Workplace Injury Attorney and inquire about your chances of obtaining workers’ compensation benefits. Feel free to give us a call at any time; the first consultation is free of charge. When you cannot see properly, your chances of slipping and tripping increase drastically. Proper lighting inside and outside of the workplace is needed in order to reduce the risk of falling. If your workplace has obstructed paths with bad lighting, consider letting your employer know. An unobstructed path minimizes the chances of employees tripping or falling down. Another reason why so many individuals end up falling down is the wet floor. If there is a sign saying “caution” or “Wet floor”, go around it. There is no need to walk over it as you will most likely end up with a serious back injury. Someone put that sign there for a reason. If you are working in extreme conditions (wet or oily floor being one of them), be sure to wear the right equipment such as non-slipper boots. If you get injured, speak with Workers Compensation Attorney Los Angeles and learn more about your legal rights and workers’ compensation. How to Get Child Custody after Divorce?